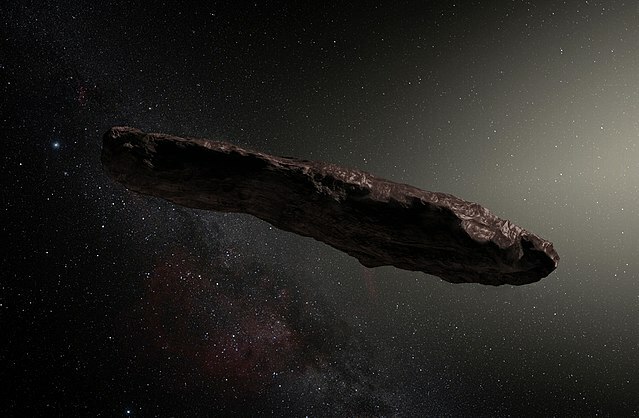 The Internet (or at least, certain corners of the Internet where conspiracy theories thrive) is abuzz with speculation that the extrasolar asteroid ‘Oumuamua, best known, apart from its hyperbolic trajectory, for its oddly elongated shape, may be of artificial, extraterrestrial origin. Some mention the similarity between ‘Oumuamua and Arthur C. Clarke’s extraterrestrial generational ship Rama, forgetting that Rama was a ship 50 kilometers in length, an obviously engineered cylinder, not a rock. But then… I suddenly remembered that there was another artificial object of extrasolar origin in the science-fiction literature. It is Iilah, from A. E. van Vogt’s 1948 short story Dormant. Iilah is not discovered in orbit; rather, it lays dormant on the ocean floor for millions of years until it is awakened by the feeble radioactivity of isotopes that appear in the ocean as a result of the use and testing of nuclear weapons. Iilah climbs out of the sea and is thus discovered. It becomes an object of study by a paranoid military, which ultimately decides to destroy it using a nuclear weapon. So here is the thing… the Iilah of van Vogt’s story had almost the exact same dimensions (it was about 400 feet in length) and appearance (a rock, like rough granite, with streaks of pink) as ‘Oumuamua. In fairness to the conspiracy theorists, Rama was, originally, thought to be an ordinary extrasolar rock. IIRC it took a probe flyby to definitively discover that it was a ship, although the astronomers noticed enough oddities to get the probe in the first place.